With the arrival of 2010 comes my first blog anniversary. YAY! Looking back through the posts, I am glad to see all of the projects that actually made it to camera ready status. This New Year has me resolved to set aside even more time to create art and explore different mediums. Because it makes me happy. Try it! You'll see. Happy New Year Genevieve! 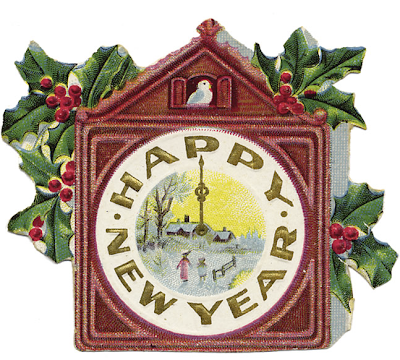 I hope you have a wonderful artful 2010. I love the pink wreath you received from your swap partner. I can see why you will keep it up all year! Ah yes! Every year I hope to try out new crafts and new techniques! Can't wait to get started!